I like the ones the Plumber/Roto Rooter brings, when the drains are stopped up ..
you give ya money away to have someone do something you could do ya self? I think garter snakes are a little smelly. I picked them up as a kid, but don't particularly like handling them now. 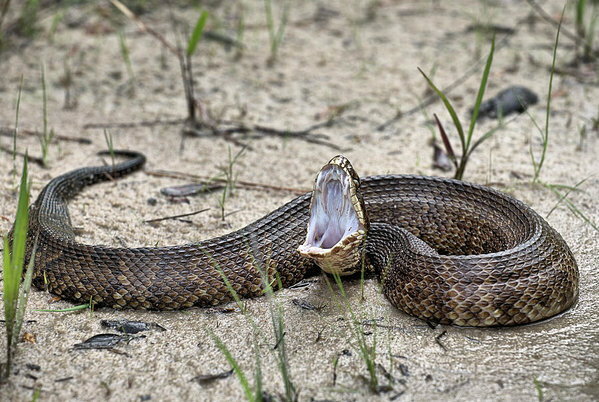 The other common local snake we have are gopher snakes (the same as, or closely related to bull snakes). They do look a bit like the much more rare rattlers, but are harmless. I've pushed a few snakes off the road this year, and will continue to keep my eyes open for snakes in bad places. Don't think Smiley here won't come right at you as a measure of defense no matter what anybody on YouTube might tell you. Because Cottonmouths don't have that reputation for nothing and sometimes they might. I don't know whether it was bluffing or not. All of us standing on the lake shore commenced to moving right away. The rattlesnakes on one of the family member's farm are regularly fed snake shot. I had a female, 5 year old ball python for awhile. Cool pet, but really boring after awhile (they're nocturnal and timid, they don't sun bathe). I got tired of struggling to feed her. If I ever try again I'll get a native snake, one that enjoys sun bathing.